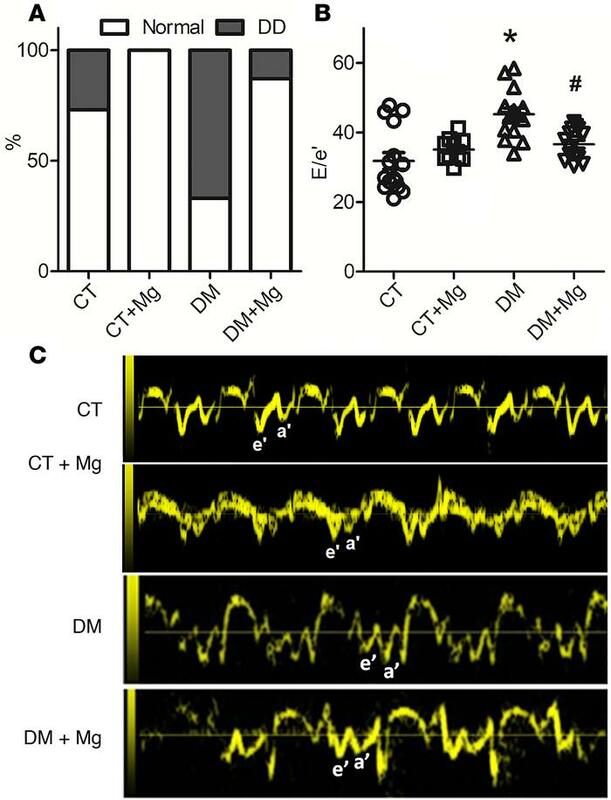 Dietary Mg improved cardiac diastolic dysfunction of DM mice. (A) Incidence of diastolic dysfunction (DD). (B) Mitral annulus TDI E/e’. (C) Representative tissue Doppler echocardiography images in control (CT), CT+Mg, DM, and DM+Mg mice. Ten to 15 animals were tested for each group. One-way ANOVA with Bonferroni post hoc test and the χ2 Fisher exact test were used; *P < 0.0001 vs. control and #P < 0.001 vs. DM. CT, control mice; CT+Mg, control mice fed with normal chow and Mg in drinking water; DM, diabetic mice fed with high-fat diet; DM+Mg, mice fed with high-fat diet and Mg in drinking water. DD, diastolic dysfunction; E/e’, the ratio of transmitral Doppler early filling velocity to tissue Doppler early diastolic mitral annular velocity.